I think shopping for the tiniest of tots is almost more fun for the adults than it is for the kids when they receive them. 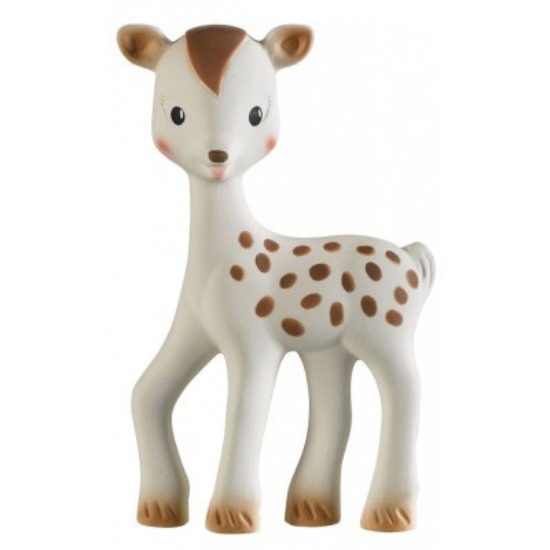 The toys for this age range are super tactile, insanely cute and the colours are just gorgeous – scroll through this gift guide and you’ll see what I mean. You can’t go past Apple Park when you are looking for toys that are not only unique and lovable but also safe and eco-friendly. One hundred per cent organic and beautifully packaged, there are six different animals (pictured above) to choose from. Retailing for $69, you can buy them direct from Apple Park. TinyBitz is renowned for their clever solutions that take the leg work out of gift buying and these hand-crocheted Christmas rattles make a perfect gift to send by mail. 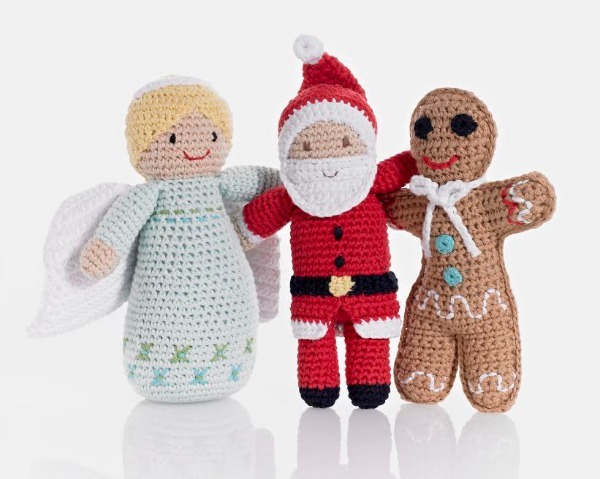 There are five festive rattles to choose from including an angel, Santa and gingerbread man. These keepsake gifts will definitely bring Christmas cheer. You can buy these one-of-a-kind rattles for $24.95 each from TinyBitz. Chicco’s range of toys take developmental learning and practicality to another level and their latest offering is no different. The music band table offers three removable instrument activity centres including a drum section, maraca module and DJ console that will provide endless entertainment. You can purchase one for your budding musician for $99.95 from leading toy retailers or through ChiccoSHOP. 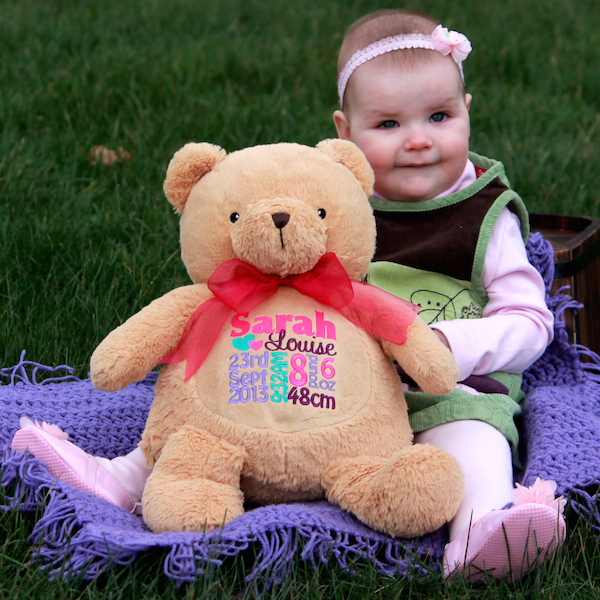 A commemorative teddy bear from Kembroid is perfect for baby’s first Christmas. This bear comes personalised with all the important details from your special little one’s birth on the bear’s tummy and you can even include a special message on its back. All messages are fully customisable and are embroidered on to the bear in modern fonts in your chosen colours. Starting at $55, select a bear or choose another animal or keepsake from Kembroid’s extensive range. The next best thing to sleeping on a parent’s chest, this cuddly plush is more than just a cute puppy. The Homedics Sounds & Night Light Glow Puppy plays four calming sounds like a heartbeat and white noise and four lullabies including Twinkle Twinkle and Hush Little Baby. This clever self-soother has a built-in night light and an automatic timer so you can determine exactly how long you want the music to play. Buy it through Little M Designs for $44.95. Move over Sophie the Giraffe, Fanfan the Fawn has stolen our hearts. Affectionately known as Sophie’s adopted little brother, Fanfan ticks all the gift-buying boxes. Completely adorable, no hard edges, made from 100 per cent natural rubber and paint and developmentally appropriate, Fanfan is perfect for little mouths and curious hands. Buy this cute little guy through Les Folies for $28. The thing we’ve learnt about being mums is you can never have enough teething toys. So this wooden stunner from German toy company Haba is a must. 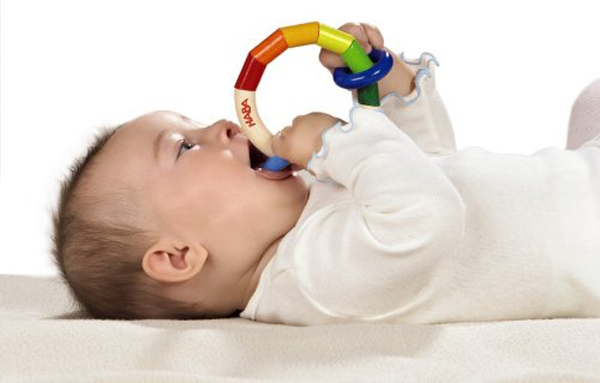 Made in Germany from beech wood and non-toxic water-based stains, the bright colours grab baby’s attention and the wooden rings give little ones something to clutch and mouth. 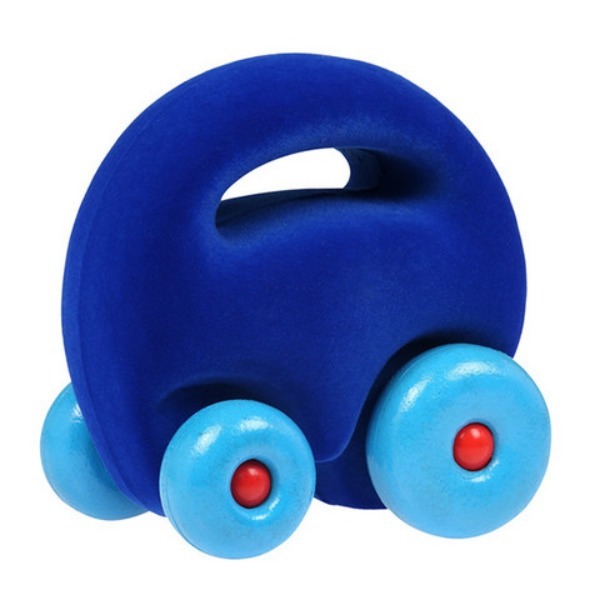 The Haba Kringelring Clutch Toy costs $19.95 from Entropy. Here’s a fresh take on an old idea – a geometric splash of colour gives these blocks a modern edge and they can easily double as a nursery decoration and toy that kids can’t wait to get their hands on. Babee and Me creator, Rachel McKenzie, is passionate about bringing a unique, fun and handmade touch to popular toys and we love her style. 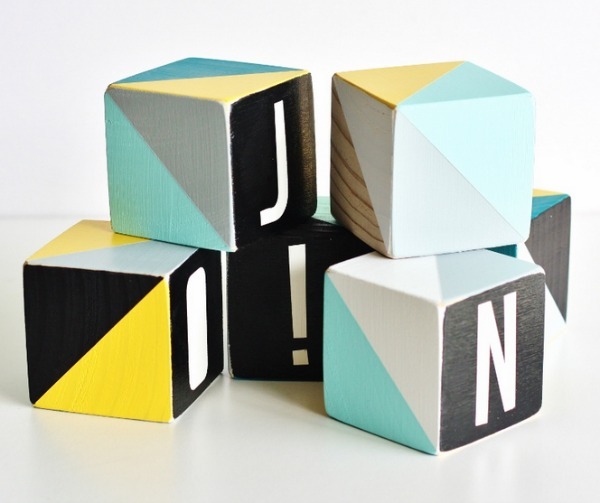 Available in a small (4.2cm) and large (7cm) sizes, these blocks are completely customisable by colours and letters. Each block is hand sanded then painted using eco-friendly paint and non-toxic acrylic. The blocks pictured are the large size and cost $9 each. Make sure you check out the full range of blocks and other toys online at Babee and Me. The Rubbabu Mascot Grab’em Car is ready to zoom around the house! In bright colours and a soft tactile material, these durable toys are perfect for little hands to grasp and play with. Rubbabu’s hand-made natural foam toys in simple shapes and bright colours are loved by kids and parents alike. They are strong and durable and great for imaginative play, the Rubbabu Mascot Grab’em Car is available through Suki Mama for $14.95. 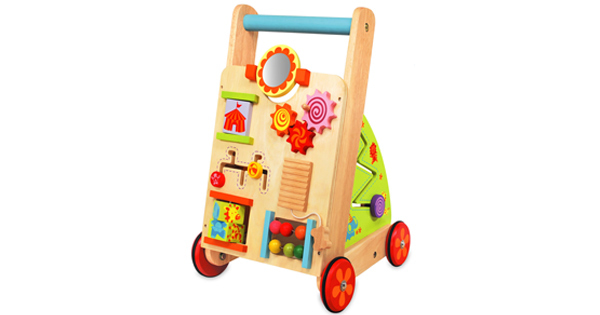 An activity centre is always a favourite toy that can grow with young kids and we love how this First Activity Walker from I’m Toy is jam-packed with learning activities. Produced from sustainable rubber wood and finished with non-toxic paint, this toy encourages hand-eye coordination, movement and problem solving. Buy this walker for $119 from I Love You This Much. Every baby needs a friend for bed and this timelessly quirky crocheted grey monkey from La De Dah Kids is a favourite that we keep coming back to. Durable and gender-neutral, this soft toy has a lot of newer friends these days including Demi Deer and Terry T-Rex that you’ll want to check out too. Still $60 and still ethically handmade, you can find this monkey and his friends online at La De Dah Kids.